A good set of running boards sure helps on that first step! It's getting pretty sad. 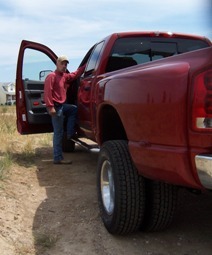 Without the running boards my old leg can barely lift my tired ol' foot up high enough to climb into the cab!You know you're gettin' old when you start to consider climbing into a pickup a pretty impressive accomplishment! But anyway, I expect a lot of people really want a set on their own rig. They do dress it up a considerable amount. And, it is kind of amazing how much easier they do make climbing into the cab! I chose to go with the Platinum variety from Westin. Chrome on stainless steel. It's supposed to have the most durable finish. 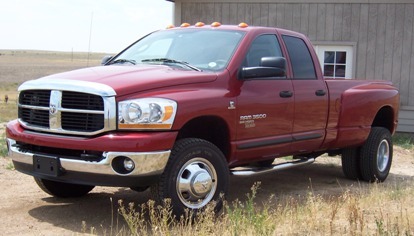 Since this may well be the last NEW truck for this old cowboy, I opted for what they claim will endure the longest! The tube style is my preference as well. Some folks like the standard flat sort of board, not me. Don't really know why, I just don't like the style of them. Others will tell you that the flat boards give the greatest protection for the rocker panels, in addition to easing entry to the cab, and that is true. For me that's not much of an issue. Big Red is going into the shop in a few days to get the bed lined. The rocker panels will get coated at the same time, with the same material that'll be the protective layer in the bed.. So they'll already have their own layer of protective armor! I didn't check to see what the cost of having a shop do the installation would be. But at probably two hours of billed shop time and figuring $50 to $75 per hour, you can save a goodly amount doing it yourself. The first one takes the longest, as you figure out what goes where, and then the second side takes maybe half as long. Pretty straight forward. I wouldn't hesitate to tell you to do it yourself. Everything bolts right into place. No holes to drill, everything fits up well with a minimum of "convincing". So if you need a little help climbing into the cab of that big, tall 4WD tow vehicle of yours, put on a set of running boards and tell everyone it was to make it pretty!